A lightweight helicopter, Eurocopter EC120 Colibri (Hummingbird), had to make an emergency landing on an open field at Woodlands Avenue 10. 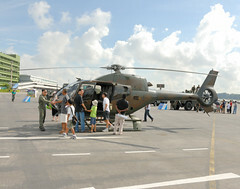 The ST Aerospace owned helicopter is used to train RSAF pilots. According to MINDEF, there had been a possible problem with the gear box when a malfunction light lit up. The pilot landed the helicopter as a precaution on the open field. No one was hurt in that incident. The RSAF technician then made their way to the site where the craft had landed. They checked the helicopter and flew it to an ST Aerospace facility in nearby Seletar Airhub. ST Aerospace provides the Republic of Singapore Air Force (RSAF) a fleet of five EC120 Colibri helicopter with full technical and logistic support for the fleet over a period of 20 years. Under the programme, ST Aerospace will own and maintain the Eurocopter EC120 Colibri helicopters, while actual pilot training is performed by the RSAF 124 Squadron.